Baseball and basketball kept Harden focused and off the streets. His own story is the motivation for his AAU teams in Houston and Arizona. A beardless James Harden once took long bus rides from the streets of Compton, California, to his high school gym as the sun came up. A focused teenager dreaming of the NBA was up early working on his hoop skills at 7 a.m. before his first class. Today, the 2017 NBA MVP candidate is focused on trying to win a championship with the Houston Rockets. But when time permits, Harden is preaching the importance of using sports to help you succeed in life — just as he did — to teenage boys playing for his new AAU basketball programs in Houston and the Phoenix area. “I know what these kids are going through now in Houston and Arizona,” Harden told The Undefeated. “I just give them something to be active and stay away from all the negatives. This is something that can help their families in the long run. Harden was born on Aug. 26, 1989, in Los Angeles. The five-time NBA All-Star and his two siblings were raised by their mother, Monja Willis, in Compton, which had a reputation for gang violence and drive-by shootings in the 1990s. Between 2000 and 2016, 91.5 percent of the murders in Compton were by gun violence, compared with the national average of 67.7 percent, according to the Los Angeles Times. Compton had the eighth-highest crime rate in the country in 2010, according to the FBI, but it has improved in recent years, as there were 15 homicides in 2015. While Compton isn’t quite the N.W.A.-known “City of Compton” anymore, it was certainly a challenge for Harden as a kid. To help Harden and his older brother stay on the right path, Willis turned to sports to work “hand in hand” with her. She says sports gave them something positive to do that was physically active. Harden’s first love was baseball. The southpaw described himself as a great pitcher and first baseman. James Harden (No. 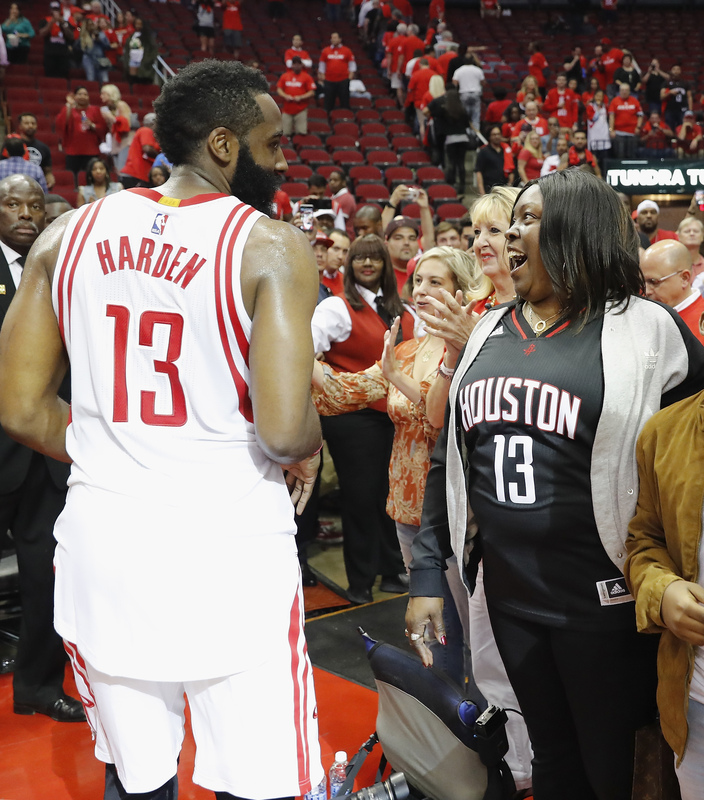 13) of the Houston Rockets greets his mother, Monja Willis, after Game 2 of the Western Conference quarterfinals game against the Oklahoma City Thunder during the 2017 NBA playoffs at Toyota Center on April 19 in Houston. “He started out playing baseball,” Willis said. “I took him to a [basketball] gym and he was too young to do the fundamentals. He could shoot, he just couldn’t do the fundamentals, so he didn’t want to do that. ‘Mom, I don’t want to do that.’ OK, you’re not ready. I put him on baseball for about three years. So how good was Harden in baseball? “I was a little Randy Johnson,” he said. Willis said Harden wanted to start playing organized basketball around age 10. He quickly fell in love with the game after playing for a parks and recreation team in nearby Watts. There was a hoop put up on the garage door at his house so he could work on his game in his free time. Harden stayed busy with school and playing sports year-round. “I always had something to do,” Harden said. “I was playing T-ball at first. My mom always took me to practice after school. I was always on the move. I didn’t really have time to sit around and start hanging out with whoever. After T-ball I went to basketball, and after starting to play basketball, that’s when I fell in love with it. I just kept going. It was a cycle from here on out. Harden once wrote a note to his mom while in high school: “Could u wake up at 7:00. And could u leave me a couple of dollars. – James Harden. P.S. Keep this paper. Imma be a star.” He was right, as he is now arguably the NBA’s most intimidating scorer. She still has the paper. Harden quickly developed a nice shooting stroke. After he got in better shape and overcame asthma, his hard work those early mornings in the gym transformed him into a high school national superstar. Harden led Artesia High School in Lakewood to California state championships in his junior and senior years. The McDonald’s All-American selection also made a name for himself on the AAU circuit, leading Southern California’s Pump-N-Run Elite to a 2006 Las Vegas Adidas Super 64 championship. Harden went on to star at Arizona State for two seasons before being selected by the Oklahoma City Thunder with the third overall pick in the 2009 NBA draft. “He was a freak. We obviously didn’t know how great he would be,” Dana Pump, president and CEO of Double Pumpan Inc., told The Undefeated. “His character is off the charts. He doesn’t do drugs. He’s a winner. He was an old soul back then. A basketball junkie. He scored baskets and was a winner. Several NBA stars — including Chris Paul, LeBron James, Bradley Beal, Paul Pierce, Kevin Durant, Damian Lillard and Carmelo Anthony — have their own AAU basketball teams that they use to mentor kids and grow the game. Add Harden to the list. Harden joined the AAU ranks by starting his own elite basketball teams, with two in Glendale, Arizona, and two in Houston in 2016 sponsored by Adidas, the company with which Harden has a shoe deal. He has visited his AAU kids in Houston several times and visited his AAU kids in Arizona when the Rockets were in Phoenix in early April. Several of Harden’s AAU kids are already being recruited heavily by colleges. While basketball is the hook, Harden has a deeper message. Team Harden’s 17-and-under team in Arizona is competing in the Adidas Gauntlet elite league this year and was 3-1 at a recent tournament in Atlanta. Willis plays a strong role in overseeing the programs. She is currently looking to build a Team Harden basketball facility in Houston that includes a gym, after-school care and tutoring. “It’s important to him because that’s what he grew up doing. You keep these kids’ mind occupied and their bodies working hard on any sports — I don’t care if it’s basketball, football, baseball or soccer — it takes away that devil in their life. It keeps their mind and body busy and doing something positive,” Willis said. The coaches in the Team Harden programs have experience playing on the college level and played in either high school or college with Harden. The two-time All-NBA selection has also helped his close friends land jobs with Adidas and with Stance Socks, which are used by the NBA. Willis said her son “has a good heart” and wants to make sure his friends are doing something productive.